Hundreds of kids running around downing Jell-O incased gold fish is just one of the many things that make Vacation Bible School one of the craziest but most exciting events on the church calendar. As the week of crafts, games, and singing unfolds, Christian parents and youth have the chance to pour the gospel directly into the heart of kids. But as with all good church programs, Christians must actively work to keep VBS focused on preaching the gospel of the kingdom of God. Several VBS publishers have begun to tailor their programs to church kids. These curriculums emphasize God’s love, obeying parents, or caring for schoolmates. They want kids to bounce out of the closing ceremony with a better understanding of how to be good Christian. 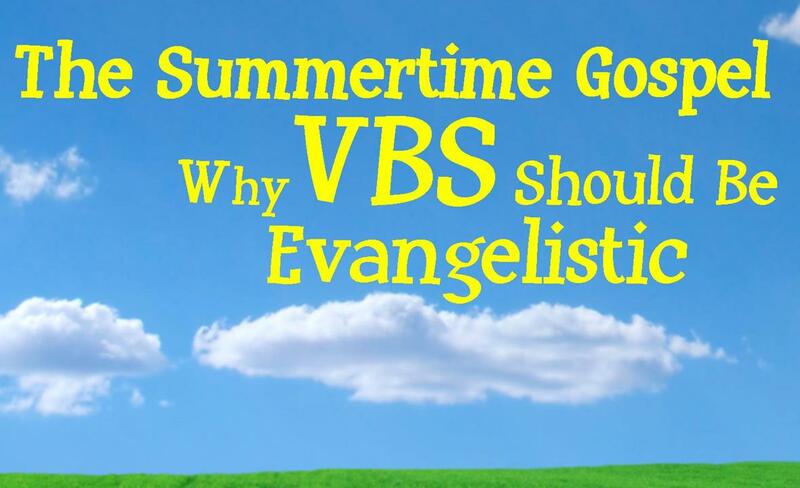 Though well intended, the move to make VBS into a summer camp-style-refresher course on the merits of moral living is not the best use of church resources. The people of God are called to be evangelistic. We are to follow Christ and proclaim the gospel of the kingdom of God (Mark 1:14-15). Our goal should not be to turn outreach programs into members’ only ministries. Not too long ago, the evangelical church redid Sunday school, changing it from a program designed to reach poor, inner-city kids into a muffin filled fellowship time for adults. Now I don’t think adult fellowship times are evil. But we must be careful not to become so focused on meeting our own needs that we close our eyes those outside our walls. One program that traditionally has had an outside focus is VBS. Let’s keep it focused on the Great Commission by inviting the community to attend. Though reaching the community is hugely important, an effective VBS also needs a message that connects to those outside the church. If we call unsaved kids to be good without offering them the power of the gospel, we will confuse them in one of two ways. Either they will leave depressed because they cannot be meet the impossible standards of Jesus or they’ll leave a VBS t-shirt wearing Pharisee, who is convinced they can conquer sin through sheer will power. Let’s not leave kids hopeless or help them cover up their sin nature with some spiritual self-esteem. Let’s faithfully proclaim the gospel, trusting that God will work mightily! Now when it comes to preaching the gospel this summer, we do not need to restrict it to an emotional display that climaxes with a pastor passionately asking kids to accept Jesus because “He will make everything better!” After all, who wouldn’t sign up for their best life now by repeating the short phrases of a sinners’ prayer? A better option is to make all of VBS be about the gospel. We should choose curriculums or create programs that help the kids singing in our pews to understand the depths of their sin. Then, we direct these energetic souls to Christ who has paid for their sin. We offer them the hope of eternal life while reminding them that to gain true life they must abandon their self-centeredness. Jesus said, “If anyone would come after me, let him deny himself and take up his cross daily and follow me. For whoever would save his life will lose it, but whoever loses his life for my sake will save it” (Luke 9:23-24). What About The Church Kids? Now some might be concerned that a VBS focused on the gospel might fail to connect with the church kids. First, we need to remember that our good church kids might not be saved. They could be all about the nice things in life because they hope their mission’s offerings and Sunday school attendance will get them into heaven. Second, we need to remember that our goal is not to help kids pretend that they don’t need a savior. Even saved children still need to be reminded of the cross and of their need to depend on Christ alone as the live they Christian life. “The cure for kids who feel burdened by sin is not to ignore the topic (they feel the burden anyway, even if that aren’t talking about it), but to administer large doses of the good news so that their faith Jesus grows” (Klumpenhower, p. 39). The gospel is relevant for every kid regardless of how many times they went to Sunday school. This summer, let’s make the VBS all about the gospel! Show Them Jesus: Teaching the Gospel To Kids. Klumpenhower, J. (2014)Greensboro : New Growth Press .